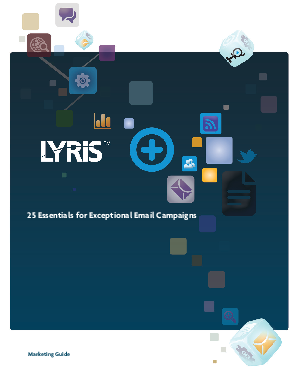 White Paper Published By: Lyris, Inc.
Are you overlooking some of the "essentials" necessary for success in today’s complex email marketing world? Today’s savvy marketers must navigate through a complicated landscape of shifting customer expectations, challenging new technologies, evolving government regulations and other issues old-school direct marketers never had to face. There’s a lot at risk for those who don’t follow the essential rules of email engagement- from undelivered emails and missed sales opportunities, to blacklisting and beyond. Reduce those risks and conquer email marketing challenges with fundamental best practices that will help you get the most from your email marketing efforts. Let the 25 Essentials for Exceptional Email Campaigns be your guide to better email marketing campaigns and improved ROI.